unable to take the time to go to church in the middle of the week? How many are ill? For whom is the reminder of death all too present, too imminent? Last week, my grandmother died. Yesterday, I held the prayer book she gave me for my 11th birthday in my hands and read psalm 51. The priest had just looked into my eyes and firmly, sternly reminded me, “Remember that you are dust, and to dust you shall return.” It made me sadder than I had expected–it ushered me into a mourning I had not anticipated. Today, we begin our journey through the stations of the cross. question as we start Lent. incomprehensible promise of life which will come out of death. So now it’s the third Sunday of Advent the Sunday called Gaudete (Rejoice), as the Lord’s arrival is near. The Church wears rose-colored vestments as a sign of the joy we feel anticipating the birth of the Savior which is to come very soon. At St Luke’s, we wear what we have of a rose set (a chasuble, pulpit fall, burse, veil and our priests wear rose stoles). We also have rose-colored flowers today in the sanctuary. In our exploration of the symbols on our Advent cope, we are up to the T for St Thomas whose feast day is December 21st and the sun for the remembrance of the Dayspring on December 22nd. .
O Thomas Didymus, through Christ who suffered you to touch him, we entreat, you by your prayers for us on high, to aid us in our miseries, lest we be doomed with the lost when the judge appears. December 21st is the traditional day of the martyrdom of the apostle. Sacred tradition says that Thomas was martyred in Mylapore, India having a spear thrust through him. The Mar Thoma Church of India is the legacy of the ministry of St Thomas. There is a Mar Thoma congregation in New York who used to meet on Sundays afternoon in the undercroft of Church of the Intercession uptown. I was there once as part of a Churches of New York Architecture Tour just after the Mar Toma congregation finished worship and, boy, could they could teach St Luke’s something about the use of incense. It was so smoky and they had finished the service almost 30 minutes before I was there and the undercroft certainly had an aura of sanctity. I always find it a bit jarring to be thinking of Thomas, who has such a large a role in the Easter narratives, so close to Christmas. I don’t ever remember anyone named Thomas in any of the Christmas stories I have ever read. You know that the doubting Thomas story is the Gospel for the Sunday after Easter every year. Then again, the Thomas story is focused so much on the physicality of the Risen Jesus, when Jesus invites Thomas to reach in and feel his wounds, that it makes such perfect sense, as we get ready to celebrate the mystery of the Word-made-flesh remembering Thomas’ shining hour. Thomas is our reminder that the babe in Bethlehem grows up to be the Risen Jesus in the upper room who is my Lord and my God for us all. O Dayspring, brightness of light everlasting and sun of righteousness: come and enlighten him who sits in darkness, and the shadow of death. Dayspring is not a word that we use in everyday speech. I had to look up exactly what dayspring means. It is the time before the dawn when the horizon can be seen and perhaps the outline of some objects. In the liturgical life of the Church, it is the hour of Prime, the first prayers of the day. It is very early in the day and it can be a magical time when the light overtakes the darkness, the rising sun is anticipated well before it is actually seen or the heat of its rays are felt. It is a time of great possibilities, the day has just begun and anything is possible. This brings to my mind the passages from the Gospels that tell of the first Easter Day “after the Sabbath, as the first day of the week was dawning” when the women went to the tomb of Jesus. So, once again, so close to Christmas I have Easter on my mind. I always think of Christmas as the miracle in the middle of the night while Easter is the miracle of the dawn. Last week I told you one of the secrets of the sacristy that we have a purple low mass set for Advent. I remember many years ago the designer and creator of the set, Graham French, telling me that the set was meant for both Advent and Lent since it was purple with silver trim and so was a penitential set since it had no gold. Next week we will hear about the last two symbols of the Advent cope. Our Gospel Lesson for Sunday Advent 3 is Luke 3:7-18, the old chestnut of John the Baptist addressing the “crowds that came out to be Baptized”. I have a confession: people specifically, the unwashed public up close in crowds, repel me. In March I began a job working in what I refer to as Tourist Zone 2, in the shadow of the Tiffany star at 57th and 5th, just south of Central Park South and The Plahza. Having to maneouver my way through “children laughing and people passing meeting smile after smile” while I’m trying to get from my crowded train, around two construction sites, the Apple Store and lines of rickshaws on the way to my office every morning is an object lesson in prayerful meditation during my Advent practice. I do love people in general, however, and what fascinates me most about them in the abstract is what they pray about and what they pray for, and what they think about and what they say out loud. An hilarious thing to me in this vein is when I used to watch one of my girlfriends at my old job go COMPLETELY berserk because she would ritually give work to one particular department at the firm and they would ritually COMPLETELY mess the project up requiring her to do the whole project all over again herself. You would think after a couple of times, let alone every time for my eleven years with her, it would cease to be a surprise and become an expected behavior, yet each and every time she would become exasperated all over again in new and exciting ways, together with tried and true rants, about that department’s incompetence. I do it myself, especially with my weight gain over the last 11 years. I keep saying, I’m so fat, I’m so out of shape, I need to lose this weight, one of these days … Backstory: I was in a miserable job, I ate and drank my feelings and now, 60 pounds overweight, I keep saying, UCH ! I’ve GOT to get this weight off … then I think, but it’s Easter, just these few chocolates; oh, it’s Halloween, my yearly Snickers bar (and not many kids came by this year so what am I supposed to do with these leftover Hershey miniatures); dear, here we are at Advent again, I have to make my sister-in-law her favourite holiday cookies. I balance my exercise routine with the substantiation that we live in New York and I walk miles every day, so I must be healthy, plus we don’t have enough money to join a gym; the Ashram is so inconvenient to practice daily … like I can’t practice yoga on my own floor at home, as if I don’t have free On Demand exercise channels, can you imagine MAKING the cookies but not waking up in the middle of the night and have SEVERal, rationalizing it by pretending I have a sleep-eating disorder. Oh, and then there is the daily free leftover catering at work, like I seriously need a brownie and an extra sandwich just because they’re free and have no calories (but I don’t eat the bread, so that’s healthy). As Ethel Roberta Louise Mae Potter Mertz used to say in an exasperated tone, “Honestly, Lucy”. I’m (obviously) no scholar, but I was learned [sic] that between the writing of 4th Maccabees (≈19 B.C.E.) and when we presume John began his ministry of baptism (≈26 Anno Domini), the countryside was bursting at the seams with Messiahs. Everyone was looking for Him and it seemed there was one on every corner, so John by the Jordan River was not as much an oddity as we might think. What gave him distinction, however, was a new message: repentance. Metavnoia, μετάνοια, a change of mind, the act of heartily amending with abhorrence one’s past . The system of Jewish ritual since it was handed down from God by Moses afforded propitiation of one’s wrong-doings through ritual sacrifice and the assurance of no guilt from wrong-doings by adherence to these rituals. No concept of remorse, no practice of inner reflection, no sense of personal responsibility for the wrong-doing, just the clearance of the balance sheet through performance of a ritual. John came to announce a new path. We pronounce the Confiteor during Eucharist and at least twice each day, at morning and at evening prayer, and the words flow so easily from our lips, just like the Lord’s Prayer, but do we mean them? Do we realize what we are saying? Do we examine our hearts and make amends and attempt repentance, a turning away? I’ll tell ya, it would be easier for me to give up one of my two cloaks to a stranger in need sometimes than it is for me to let go of the resentment I feel from an offense I perceive from someone, or to abandon some judgment which brings my heart to hatred for someone, seldom realizing that I must be guilty of the same thing I despise in them or else I wouldn’t know how to recognize it. 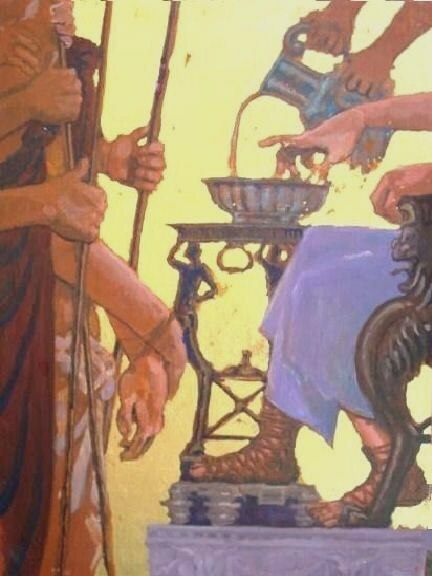 We are guided by John in our Gospel Lesson to make straight our paths, to prepare the way for the Lord and to lay the foundation of reasonable and just behavior, guiding us to await in joyful anticipation the cleansing fire with which Jesus will baptize us. “As the people were filled with expectation…” In my very humble opinion, I find The Revised Common Lectionary a bit clumsy this time of year, as it requires us to be very nimble bobbing from nativity narratives to Jesus’ early ministry, a visit with Doubting Thomas and our risen Lord with a side trip to the fiery fields of Armageddon before we dock with shepherds watching their flocks by night. I buoy myself during the season of anticipation by remembering that we’re not just waiting for this grown-up Messiah, or for the return of the Christós; we’re also waiting for the birth of a little baby. Advent calls us to a season of clarity, expectation, renewal and new birth … not just a season to sing pretty songs and hear pretty stories but a season of preparation, readiness. A chance to cast off our own chaff and blossom as mature grains of wheat to be gathered in to God’s granary lest we be consumed by unquenchable fire, ingesting this call to excellence and heeding the exhortation that we should not rely on the devotions and practices of our past, but be revitalized by a renewed and passionate present so that we are worthy to greet the coming of our Savior, whether his first arrival or his second. Not just to hear John proclaiming the Gospel that whatever I have is so bountiful and sufficient that, if I give some away, grace and bounty will be mine. As he tells the soldiers, I should be satisfied with exactly the blessings I have. And as I tell myself, concentrating on being overweight is not going to lose me weight and “one day I’ll get to that” doesn’t get me fit. Watching my intake, planning and attending to my practice, and steadfast diligence is the key to my success. Isn’t that true for almost everything in life at which we wish to excel? You are currently browsing entries tagged with episcopal at Blog of St. Luke in the Fields.